*** Taking ‘Cold Start’ out of the freezer? In a wide-ranging interview with India Today, the new Chief of Army Staff, General Bipin Rawat, appeared to drop a bombshell by acknowledging the existence of the army’s Cold Start strategy. Many defence analysts presumed the army had abandoned this limited war concept altogether, or narrowly focussed on streamlining mobilisation while still maintaining the fundamental Strike Corps organisation and doctrinal concept. Either Gen. Rawat has dispensed with 15 years of semantic gymnastics and simply referred to these “proactive strategy options” by their more common nomenclature, Cold Start, or, the Indian Army has been quietly reorganising its limited war concept along more aggressive, and offensive, lines with little fanfare. The government would be wise to clarify Gen. Rawat’s statements. Ambiguity surrounding Cold Start, which incurred real diplomatic and security costs for India without delivering deterrence benefits, did not advance the country’s interests when it was first announced, and such uncertainty is unhelpful today. It’s going to be another bloody year, says the ICG’s Jean-Marie Guéhenno. Whether the carnage is in Syria and Iraq, Turkey, Yemen, the Greater Sahel and Lake Chad Basin, and elsewhere, the problem is that the sharp uptick in violence over the recent past is outstripping our ability to cope with its consequences. As a result, a “politics of fear” is spreading and leading to dangerous polarization and demagoguery. Southeast Asia in 2016 has been marked by busy political agendas, challenges by ethnic tensions, religious conflicts, and regional stability marred by external developments, most notably the US presidential election. As the region embraces for more volatility in 2017, we take a look at some of the key trends and events that happened over the last 12 months, and how they might continue to shape 2017. Trump has promised to abandon the high profile trade agreement Trans-Pacific Partnership (TPP), which Brunei, Malaysia, Singapore, and Vietnam are members of. The death of TPP could well mark the beginning of a slow death of globalisation and free trade. While the TPP is just one of the many global and regional trade treaties that the US is not a part of, the country has greatly upheld its liberal values and a retreat from such a high profile treaty is hardly conducive to the free flow of capital and goods. Many of the Southeast Asian TPP members had hoped that the TPP would help them to carry out reforms such as liberalisations and regulations, but have been let down by Trump’s election victory. The vigour of the Indian prime minister's diplomacy did not abate in 2016. Ties with the United States of America received particular attention, with five meetings with Barack Obama during the year that signified a convergence of interests in a changing global environment. In his address to the US Congress in June, Narendra Modi called the US India's "indispensable partner" and extolled it in terms that would have surprised and delighted those with memories of conflicting visions of the two countries in the past. Defence ties expanded during the year with the signing of the Logistics Exchange Memorandum of Agreement that broke with traditional Indian thinking on military relations with a foreign power and India's designation as a major defence partner, the practical content of which was finalized during the visit of the US defence secretary, Ashton Carter, to India in December. Under pressure on climate change issues, Modi found a way of working constructively with the US, drawing acclaim from Obama. By initiating the global solar alliance and adopting the hugely ambitious renewable energy targets for India, Modi took a leadership role in an area where India had been on the defensive. Two back-to-back Agni IV and Agni V missile tests with ranges of 3,500-5,000km have rattled China, particularly the growing prowess of the India's Inter Continental Ballistic Missile (ICBM) development programme. Reacting to the Indian missile tests, Global Times, the English language mouthpiece of China's Communist Party, gratuitously advised "India to cool its missile fever". It further went on to chastise India for attempting to develop an intercontinental missile capability, adding that owning a few missiles does not mean India has become a nuclear power, and that "it will be a long time before it can show off its strength to the world". The underlying reason for the Chinese outburst is Indian attempts at seeking strategic equivalence with China, through its intercontinental missile development programme that can pose a threat to China as also upset the existing strategic balance in Asia. Obviously stung by the development, Global Times went on to rant about maintaining a strategic balance in South Asia by helping Pakistan to develop missiles of similar or longer ranges, acknowledging in effect China's support to Pakistan's nuclear programme, something the world has known for long but is rarely acknowledged by China. 1. On January 9, 2017 evening, DG ISPR official twitter handle @OfficialDGISPR put out a video congratulating the country - Pakistan - for successful test of new submarine launched cruise missile (SLCM) Babur-3. 2. At a cursory glance, the video appears to be a successful test with missile exiting water surface, cruising along the coastline and finally hitting its target a red flag with a cliff faced background. The ISPR had done well to hide the missile's start, cruising journey and the target hit. But alas, it was not to be so. A pair of blasts disrupted the afternoon commute in Kabul, killing at least 30 and injuring 80 according to initial reports. The attack is the first major incident in Kabul this year, touching off what many expect to be another difficult year in the country. According to Tolonews, a suicide bomber detonated himself near the entrance to the parliament compound at around 4 pm Tuesday. 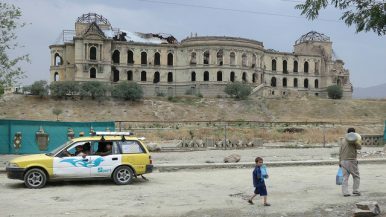 That explosion was followed by another — likely a vehicle-borne improvised explosive device — which seemed to target a convoy of vehicles escorting parliamentarians and other government officials home but also caught those responding to the first blast. The BBC reports that, according to Afghan sources, among the dead is an National Directorate of Security (NDS) head and Tolonews reports that a female MP from Herat is among the injured. Afghanistan's Militias: The Enemy Within? Just a few kilometers outside the concrete maze of Kabul, the state has little control. “This is a no-law land: we do what we please, and we ensure that our friends are safe,” says a local regional commander, a former mujahedeen, now head of a militia who ensure his American contractor partners can move safely through the area. Afghanistan, despite the disarmament program run by the United Nations, is still run and regulated by local commanders, which have given part of their arms to the government, but kept a conspicuous amount for themselves. “A militia commander registered with the government will tell you that they have four weapons with him, but he is actually carrying 200 weapons and he has 200 men,” explains Juma Hamdard, former governor and a senior commander of Hizb-e Islami, and the current security adviser of President Ashraf Ghani. India is poised to sell its sophisticated Akash missile defense system to Vietnam, the latest development in a broad strategic relationship that has grown rapidly in recent years and added a new twist to the spiraling power contest in the South China Sea. The talks, consistent with India’s ambition to be a major arms supplier, were first reported this week by the Times of India. The medium range surface-to-air missile, produced by New Delhi’s Ministry of Defense, can target aircraft, helicopters and drones up to 25 kilometers away at a time when China is building up aerial defenses over fixtures it claims in the contested maritime area. India has also offered to sell its Varunastra anti-submarine torpedoes to Vietnam amid heightened tensions with China. Vietnam has steadily built up its military capabilities over the past decade, including a surge in new foreign procurements with applicability in the hotly contested South China Sea. Beijing reacted with irritation to last year’s lifting of the US’ long-held arms embargo against Vietnam. It has not yet responded to reports of the proposed Akash missile system sale. Another goal of the information operation was to play down the significance of Beijing’s South China Sea activities in a calculated bid to avoid provoking the United States. In addition, Chinese space authorities expect to begin exploring the larger solar system. Thus far, China has not ventured beyond the Earth–Moon system. Its one attempt to do so (as a part of the Russian Phobos-GRUNT mission) was when the Russian mission failed during launch. The white paper states that China intends to launch a probe to Mars by 2020 and is also interested in dispatching probes to Jupiter and the asteroid belt. This paper examines the information operations and strategy of the so-called Islamic State (IS), to include how it administers its media activities, the reasons behind IS’ ‘virtual’ successes, and the potential long-term impact of its approach to information warfare (IW). Some of the author’s specific findings include the following: 1) IW has been absolutely integral to IS’ overall strategy; 2) the group will most likely continue to align its military and information operations in the future; and 3) the current information campaign has enabled IS to survive and execute wide-ranging terror attacks. Indeed, the campaign has been successful enough that a ‘Virtual Caliphate’ that operates independently of the group may come about. Bracing for the new cyber front in warfare, French Defense Minister Jean Yves Le Drian said France is ramping up its defenses and doubling its ranks of “digital soldiers.” In a nod to Russia’s meddling in the U.S. elections, he also acknowledged France’s infrastructure, media, and democracy are vulnerable to cyber incursions. In an interview this week with Le Journal du Dimanche, Le Drian said France must respond to an unprecedented level of cyber attacks seeking to “[tarnish] the image of the ministry as well as strategic attacks,” such as espionage and attempts to disrupt France’s drone system. To bolster its cyber capabilities, Le Drian said the French army will double the number of “digital solders” to 2,600 and recruit 600 additional cyber experts by 2019. France will also establish a new cyber command, following in the footsteps of neighboring Germany and the United States, which established its own cyber command in 2009. Before President Barack Obama leaves the White House, he could close a particularly dangerous door he left open – and fulfill a campaign pledge. Obama will give his farewell address Tuesday and there is no indication that he will say anything of significance on nuclear policy. On Wednesday, Vice President Joe Biden will give a speech in Washington announcing some modest changes to our nuclear posture. Biden will almost certainly be drowned out by the surge of nomination hearings, Senate budget votes and President-elect Donald Trump’s expected press conference that same day. Unlike Trump, neither man is prone to big statements and bold actions. In these last weeks, both are hesitant to do something on national security that would “box in” the new president. As soon as Trump is sworn into office on January 20, a military officer will start to follow him everywhere he goes. He will sit just outside the Oval Office while Trump works and just outside his bedroom while Trump sleeps and tweets. He will travel with him to Mar-a-Lago, and up to Trump Tower. When he gets into an elevator, the officer will squeeze in beside him. He spoke after his colleague, Susan Rice, the outgoing NSA, defended the current size of the NSC staff. After saying she was “struck” by how much the staff had grown between her two stints on the NSC, Rice noted the administration had cut staff by 15 percent. And she noted that 90 percent of the staff are “career national security professionals,” rather than political appointees. A new President is going to take office in a just a few weeks, and the Washington Post is worried that his promises to repair the state of our national defense is going to make the deficit worse. Given that the total debt over the past eight years grew roughly equal to the entire debt accumulated in the first 220 years of our nation’s history, this is an odd focus for the Post. In a recent editorial discussing the newly nominated director of the Office of Management and Budget (Congressman Mick Mulvaney of South Carolina), the Washington Post urges the new administration to inform OMB of the need to raise more “revenue” to pay for what they anticipate to be calls for more defense spending. In the view of the Post, “. . . achieving fiscal stability necessarily involves increased revenue as opposed to the spending-cuts-only orthodoxy” which they believe dominates the thinking of the current Congressional majority. To support their view, the Post explains that the nominated OMB Director argued in 2015 that any Pentagon spending increases had to then be “offset with spending cuts” including in other defense programs. That probably will not be what is proposed next year. In an exclusive interview with Task & Purpose, former Defense Secretary Leon Panetta explains why it’s important for civilians to maintain control of the military. We talked to former Defense Secretary Leon Panetta, who also worked as Director of the Central Intelligence Agency in the Obama Administration. He told Task & Purpose that it’s not about keeping the military out of power — it is about understanding our nation’s history and balancing it with the needs of the whole country. Does the U.S. Military Actually Protect Middle East Oil? America’s experience in the Middle East over the past fifteen years has been bruising, to say the least. For his part, President-elect Donald Trump has repeatedly, if inconsistently, exploited Americans’ frustration with what are widely viewed as foreign policy failures in Afghanistan, Iraq, Libya and Syria. At a rally last month, Trump promised to “stop racing to topple foreign regimes that we know nothing about,” adding that “this destructive cycle of intervention and chaos must finally come to an end.” On the other hand, Trump has also used brazenly hawkish rhetoric and has filled his cabinet with people not at all averse to bold U.S. interventionism. Trump’s inconsistencies aside, it seems voters welcomed his blunt criticisms of U.S. military action in the Middle East. But scrutiny of U.S. foreign policy in the region should go beyond a potent skepticism of regime change or exasperation with chasing after terrorists. In addition to our ill-fated nation-building effort in Afghanistan and the fight against ISIS, the traditional rationale boils down to oil. As it turns out, though, forward deployment isn’t all that useful in securing the free flow of oil. Despite the recognition five years ago of cyberspace as an operational domain of warfare, the military and U.S. government as a whole are still experiencing growing pains; one in particular surrounds the rules for cyber effects. Authorities for offensive cyber operations currently trigger an approval process that goes as high as the president. Part of the problem — both for the U.S. and the international community — is developing terms and norms for cyberspace that in many cases use a traditional military and kinetic effects lens to examine cyberspace. For example, James McGhee, the legal adviser for Special Operations Command North, outlines the difficulties of cyber operations relative to kinetic operations in a realistic hypothetical situation in an essay published in the Strategic Studies Quarterly, a journal sponsored by the Air Force. A joint force commander can disrupt power in a particular area, if desired, by attacking a power plant being used by the enemy either by sending a team to sabotage it, hitting it with an airstrike or missile, or through cyber means, McGhee wrote. The Alphabet chairman says a giant data warehouse would give the military Google-like capability. It would also create the richest intelligence target ever conceived. The U.S. military needs an entirely new system for storing and managing data if front-line troops are to be able to find and act on information as easily as any of us can search Google, according to Eric Schmidt, executive chairman of Alphabet, legendary Google CEO, and chair of the Defense Innovation Advisory Board. Schmidt also chairs the Pentagon’s Defense Innovation Advisory Board, a panel of technology giants that includes Jeff Bezos and Neil deGrasse Tyson. At the board’s meeting on Monday, Schmidt discussed the creation of a data storing and delivery system that sounds uncannily Google-esque. Though no individual board member contributes specific recommendations, Schmidt was clearly personally connected to this one. He explained that it rose from the group’s international discussions about future artificial intelligence capabilities and discussions with commanders across the U.S. military.